If you build it, we can enclose it. 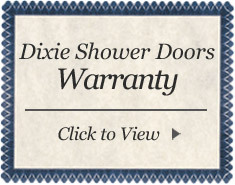 Dixie shower Doors warranties all of its installations for a period of 15 years. This applies to our professional labor only and to the original purchaser of the enclosure. If at any time during this period, you feel as though the original installation is failing, we will come and verify the issue, access the problem and make any necessary repair at no charge. There is no warranty against glass breakage once the product has left our care and custody. If, however, a panel breaks at any time, we will make every effort to make a quick replacement at the most favorable price. Manufacturer defects can occur from time to time. If we have missed something in our inspection process, you will have up to 14 days to bring this to our attention. Because warranties vary by each manufacturer, we suggest if you so choose, to call our office for more complete information. These warranties range from as little as 1 year to a maximum of “limited lifetime”. Hardware is warranted to the original purchaser and only as it relates to its original installation. Warranties do not cover improper use of cleaning products or materials, accidents, owner negligence, alterations, abuse or misuse. Wear items are not covered. For a complete list of these items, please contact our office. Sealants are used in most enclosure applications. If the installation was performed by Dixie Shower Doors, we will warranty leakage where ever sealant was applied for a period of 2 years. All warranty coverage is valid only when product is registered on-line with-in a 30 day period from date of installation.